Update: In an earlier version, TNM had erroneously identified the company as Texport Overseas LLP. The error is deeply regretted. Bengaluru police are investigating a general manager of a garment factory in Peenya over allegations of sexual harassment. Shashidhar Shetty, the general manager of Texport Apparel, a unit that manufactures garments such as Nautica and Vans, based out of the Peenya industrial area is being investigated after a complaint was made by a worker in the unit regarding an incident that occurred on March 12. 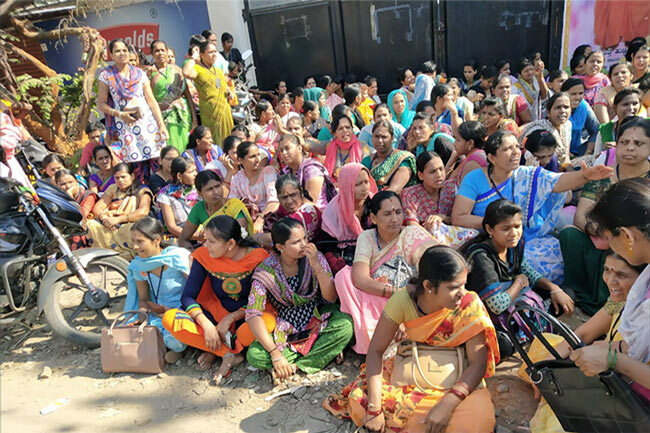 The workers, who are mostly women, have been protesting at the factory premises demanding that the general manager should be dismissed from work. The complaint made in Rajagopalnagar Police Station by the workers, states, "The General Manager summoned her, abused her verbally and asked her to obey commands and never question any of the supervisors. He threatened her and took his boots off to beat her. The garment worker made a run for it and at the behest of the GM, 20 men holding different supervisory roles in the factory chased her down and pulled apart her clothes and scratched her even as her colleagues came to her rescue.". The police have registered an FIR under IPC sections 323 (punishment for voluntarily causing hurt) and 354 (outraging the modesty of a woman) against Shashidhar and other unnamed persons. "We received the complaint only today and we have registered a case. We will be questioning Shashidhar in due course," Patil, Inspector at Rajgopalnagar police station told TNM. While he is yet to be arrested, the management of the textile unit decided to suspend Shashidhar for two days after deliberating over the incident. However, the workers are now protesting the decision. "We think that the decision was very favourable to the manager. In cases like this, the management should have suspended him for three months and conducted an inquiry in that time. The workers are also saying that the manager has a history of abusing workers for small mistakes," Pooja, Treasurer of the Karnataka Garment Workers Union (KOOGU), which is mobilising the workers' protest told TNM.